A typical septic system contains two major components: a septic tank and the absorption field. The septic tank is usually made of concrete, fiberglass, or plastic, is typically buried, and should be watertight. The primary purpose of the septic tank is to separate solids and liquids, and to promote partial breakdown of contaminants by microorganisms naturally present in the wastewater. The solids known as sludge, collect on the bottom of the tank while the scum, which is fats, oils and greases, floats on top of the liquid. The sludge and scum remain in the tank and should be pumped out periodically, by a licensed septage hauler. All septic tanks have baffles at the outlet to insure proper flow, by allowing only the liquid waste which is confined between the scum layer and the sludge layer to enter the absorption field. ​Most septic tanks are single compartment; however, in some instances a two-compartment tank, or two single compartment tanks in series, are required. Your permit will show the location and necessary steps needed to meet county requirements, and to get your system approved. Septic systems are very much like automobiles. They need periodic inspections and proper maintenance to continue working properly, and to avoid costly repair bills. 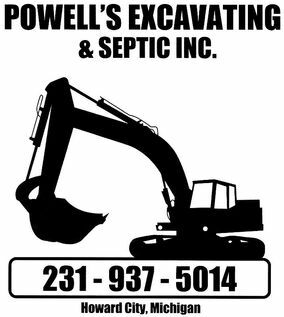 You should have your septic tank pumped every 2 to 3 years, depending on the rate that solids accumulate in your tank. While pumping, the technician should pay close attention to the baffles, and ensure they are in good condition, and are working properly. If you have an effluent filter it should also be inspected, as these require periodic cleaning. Failure to keep the filter clean may result in a backup of wastewater in the home, and no one wants that. ​Septic systems that have mechanical parts such as a pump, should be inspected at least once a year, or as recommended by the manufacturer. The absorption field should be checked for sogginess or ponding, which indicates improper drainage, a clogged system, or excessive water use. ​Please contact your local county health department for more information, or to apply for a septic permit. We are happy to help with the application process if you would like. Just give us a call, and we will get things moving.